The Seventh-day Adventist Church rose from what most would consider an epic failure. William Miller predicted the return of Christ–inaccurately, and his followers broke into multiple sects, of which the Seventh-day Adventist Church was one. The literature and ephemera of the Millerite community offers a fascinating look at religion and spirituality in the mid-1800′s. The early 1800′s saw a resurgence in millenarianism, the belief that a major event or movement would cause a drastic transformation in society. Specifically, millenarianists believed in the prophecy of Revelation, which predicts that God’s kingdom on Earth will last 1,000 years after Jesus’ return. Thus, the ground was fertile for the theology of William Miller, for whom Millerism is named. Miller started out as a farmer in upstate New York. He was also a lay preacher in the Baptist church. He embarked on an exhaustive study of the prophecies of Daniel. A subscriber to the year-day method of prophetic interpretation, Miller believed that a “day” in the Scripture represented a year of real time–meaning that we could predict the exact date of Jesus’ return. By September of 1822, Miller had published his conclusions in a twenty-point document, though he shared the document with very few people. Miller began sharing his ideas more openly among his inner circle. Initially, he met with disinterest. He said, “To my astonishment, I found very few who listened with any interest. Occasionally one would see the force of the evidence, but the great majority passed it it by as an idle tale. But when Miller began lecturing publicly in 1831, he began to gain a following. The following year, he submitted 16 articles to the Baptist paper Vermont Telegraph. Soon he was unable to personally address all the correspondence and speaking requests he received as a result of the articles. To remedy that problem, Miller published a 64-page tract that summarized his predictions. 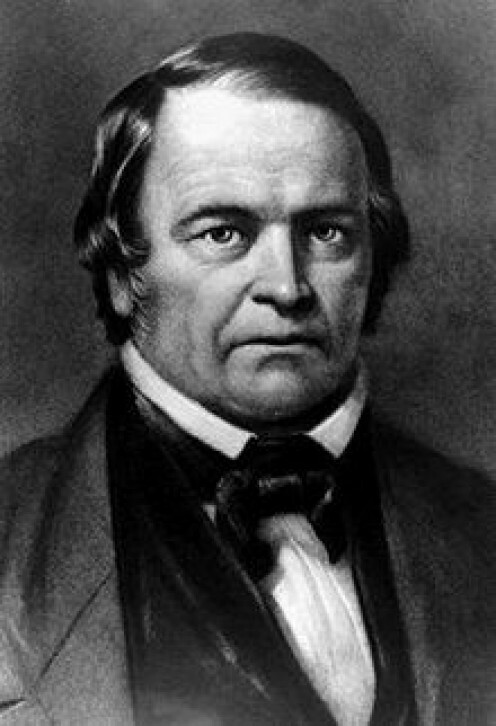 At this point, he still had not specified a date for Jesus’ return; instead, he suggested that the Advent would occur in 1843 or 1844. As the years passed, Miller gained more and more attention–in large part due to Millerite publications. Miller’s campaign got a significant bump when Joshua Vaughan Himes, a preacher and publisher, began printing the fortnightly paper Signs of the Times. The first issue was published on February 28, 1840, and the periodical is still published by the Seventh-day Adventist Church. As Miller’s ideas gained ground, numerous items in the Millerite tradition were published. One such item was a broadside called “The Battle of the Great Day.” Based on Revelation 16: 12-21, the broadside was published by prolific preacher Thomas Williams around 1838. Though several works by Williams are recorded in UMI’s “Millerites and Early Adventists,” this item is not. The OCLC lists only one other institutional holding, at Brown University. By 1843, there were at least 48 Millerite publications. Meanwhile, Miller had narrowed down his dates at the urging of his followers. Now he offered a year-long window: March 21, 1843 to March 21, 1844. When March 21, 1844 came and went without incident, most Millerites maintained their faith. They briefly adopted a new end date of April 18, 1844, based on the Karaite calendar rather than the Rabbinic one. When that date also passed, they believed they’d entered “tarrying time,” a period of waiting mentioned in both the books of Daniel and Habakkuk. This idea sustained them through July of 1844. In August of that year, Samuel S. Snow presented a new theory at a meeting in Exeter, New Hampshire. Known as the “seventh-month message,” Snow’s prediction was still based on the 2300 prophecy of Daniel, which stated that Jesus’ return would occur on the tenth day of the seventh month. Again using the Karaite calendar, Snow calculated that October 22, 1844 as the date of the Advent. When Snow, too, proved incorrect and nothing happened on October 22, the Millerites experienced what has since been called the Great Disappointment. The movement soon fell apart as the Millerites struggled to reconcile their beliefs with reality. Multiple sects emerged, one of which was the Seventh-day Adventist Church. Many Millerites turned to Scripture, hoping to find an error in Miller and Snow’s calculations. One of these was Jonathan Cummings, a farmer who’d become a preacher in 1830. Cummings wrote a lengthy letter to Himes, which was published in the Advent Herald on November 2, 1852. He offered new insight on the chronology. 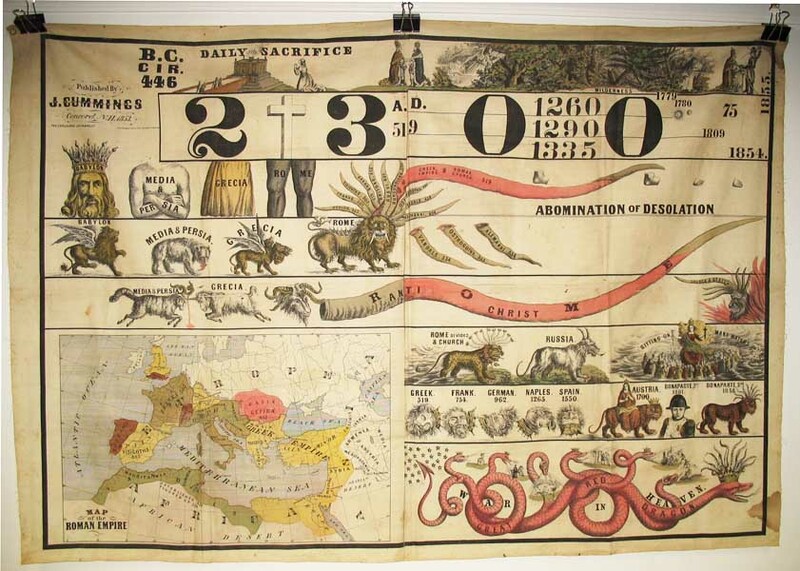 Cummings also produced a fascinating banner-size chart (pictured below and recently sold) that identifies 1854 as the year for the Second Coming. He also printed An Explanation of the Prophetic Chart and Application of the Truth to accompany the banner. While Cummings was not the only Millerite to recalculate the date of the Second Coming, his unusual chart is featured and discussed in both Cartographies of Time and the Encyclopedia of American Folk Art. The OCLC records only five institutional holdings of the banner, making it an exceptionally rare publication to be found on today’s market. The Millerite movement certainly fueled the publication of many fascinating rare books and ephemera. Tavistock Books is always interested in acquiring items like Cummings’ chart and Williams’ broadside. Please contact us if you would like more information about what we’re looking for, or if you have an item of interest. This entry was posted in 19th-Century Literature, Americana and tagged Joseph Cummings, Millerism, rare books, Seventh-day Adventist Church, Thomas Williams on May 1, 2013 by tavistock_books.